If you've been hanging out in barbecue and grilling circles for long, especially competition barbecue, you've probably heard the sage advice to "become friends with your local butcher". Well, I'd like to expand that axiom to "become friends with the butcher at a local meat market". The picture above shows the vast difference between grocery store pork and that from a local meat market that features meat from locally-raised animals. The chop on the left is from a local national chain store. The one on the right is from a local old-fashioned meat market. Let's examine the differences. The first thing I notice is the difference in color. 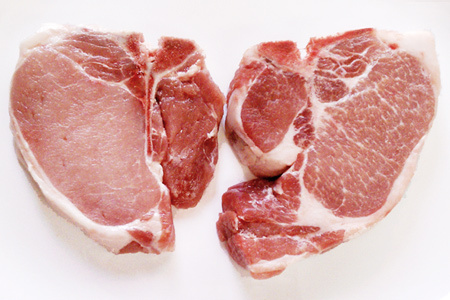 The loin portion of the store chop is a very pale pink, while the other is darker. This reminded me of some great advice that I received at Kingsford University by Stephen Gerike, Director of Food Service Marketing at the National Pork Board. He told me (paraphrasing), "Darker pork is your friend." I don't remember all the myriad details that he laid on me. It had something to do with the hogs being calm at slaughter, the myoglobin levels, and a bunch of other stuff. In my mind I boiled it down to, "Pale pig bad. Dark pig good." The next noticeable difference is the amount of marbling in the loin portion of the chops. The standard store chop screams, "Dry as Melba Toast! ", while the old-school chop has nice flecks of fat dispersed all throughout the meat. You don't need me to tell you that fat is flavor, and moisture. The last visible difference is hard to describe. The store chop just doesn't look as good. It's trimmed too close around the edges, and it simply looks, well, boring. The chop on the right has much more of a, dare I say, "come hither" look. What I'm probably trying to say is that the right one looks like good pork should. Hogs these days are literally bred to be The Other White Meat®. When Americans became much more health conscience they demanded much leaner pork. The industry responded by giving the public exactly what they wanted. We now have pork cuts that are as lean as chicken. Ironically, they've bred all of the natural fat (flavor and moisture) out, and they're now replacing it with "up to a 12% solution of (insert chemicals here)". If you see a label with that kind of verbiage, warning Will Robinson! As for price, the good stuff isn't that much more. I paid $3.49 per pound for the store chops, and $4.13 for the other. That's just over 15% more, but your mileage will vary. If you've been searching for juicy flavorful pork the way it used to be, find a local market, support local farmers, and vote with your wallet. Thanks, this is a very helpful post. My son killed a wild hog a few years ago. I couldn't believe how much fat was in the meat. It was really hard to believe. But, the color was a deeper red than the pork chops available in the grocery store. Sadly, many grocery chains now don't even break down primal cuts at the store. All the meat cutting is done at a central location, treated, shrink wrapped, and shipped. Tell them that you want some heritage Mulefoot. Loved this article. We own a local processing facility and butcher shop in central Kentucky (www.marksburyfarm.com), and I always promote our local, pasture-raised pork as a product that is obviously different and BETTER than the supermarket variety. It's terrible that the whole industry changed to actually make pork worse for you in the name of health. It's a shame, because a proper cut is so fantastic. Hope you've had a chance to try Homestead Naturals pork - the best.